Babies are always cute. 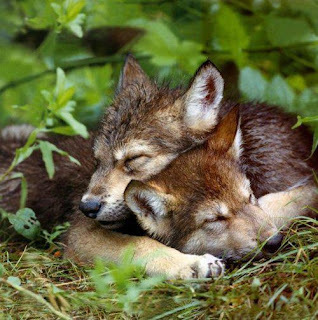 I love this picture of the two wolf cubs taking a nap. There is just something about pictures of wild animals in nature, they way they are meant to be. The wolf puppies look so relaxed and, well, happy. I hope they have a long and happy life in the wild. I know that some people hunt wolves, but I think they should be on the protected list. Wolves have been given a bad rap, one they don’t deserve. They don’t hunt people, and for the most part only invade our “space” when they have no choice, and need food. Remember, we live where they once did!